This is a very optimistic recipe for this time of year. It’s got an eye firmly on the summer, but somehow, its heat and warmth don’t feel completely out of place in the depths of February. Maybe that’s because there’s never a bad time for pork. 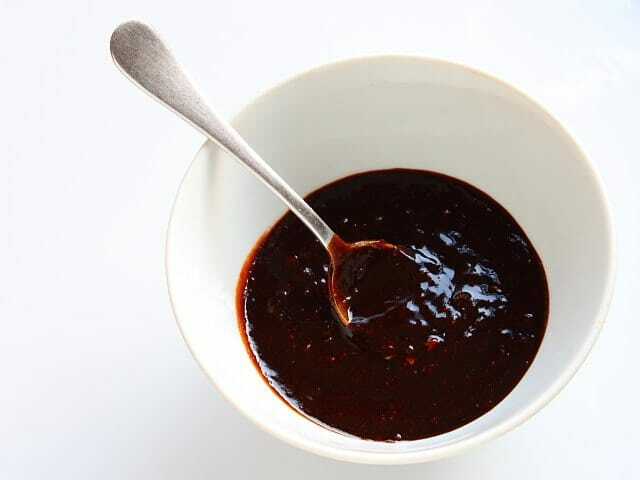 This barbecue sauce is very quick to make. It’s simply a matter of smashing up a garlic clove or three and mixing up some other ingredients. Three garlic cloves go under the knife first, chopped finely and mixed with a teaspoon of salt. Scrape the garlic into a bowl and add a tablespoon each of English mustard and dark soy sauce and two tablespoons each of soft brown sugar and tomato ketchup. Grind plenty of black pepper in – aim for about two teaspoons worth – and add two tablespoons of vinegar, a good wine vinegar, or a brown rice vinegar would be great. Mix everything together until you get a dark, ominous sludge with a thick consistency. It should have a confident, self-satisfied look about it. It should be saying, ‘Don’t mess with me. I’m a little bit evil, but you’re going to love me’. If it isn’t, add more mustard and pepper, until it starts to hurt. 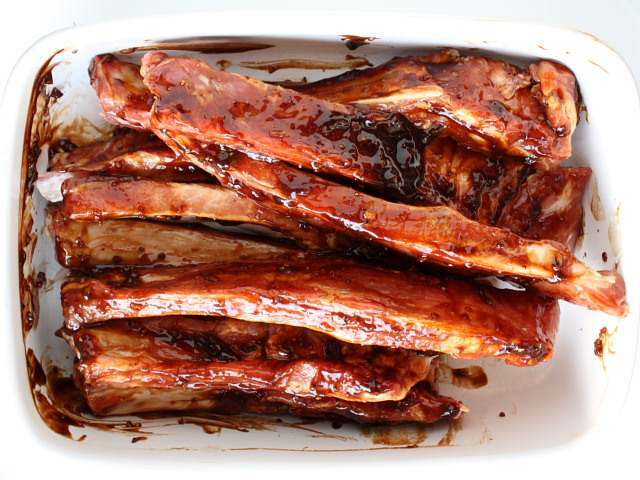 Brush your pork ribs liberally with the glaze – you can’t use too much – and leave them in the fridge for a good few hours to let the sauce attack the meat and bring it to life. Roast the ribs in a high oven until they’re dark and crisp. This could take as little as eleven or twelve minutes, but might take longer, depending on the thickness of the ribs. In summer, use a barbecue. Eat with a salad, some bread and using your fingers. Sounds like it would taste fantastic. But I feel like I need a shower after justlookinf at it in a dish! That looks fab. Is it bad manners to eat this glaze straight from the bowl? I think you've just put ribs on the menu for this week. Wow, yum yum yum! That glaze made me think of one thing…summer! But, pork, as you said, is good any time of the year. it so sexily! It even looks smoky and sultry! The ribs and their shiny glaze are something I can really sink my teeth into. Thank you for sharing the recipe for northern California has been seeing BBQ weather lately and it's still winter! Barbecue weather? In February? That's just…..unfair. get right on this…..love me some of these ribs! I'm sold. I love your description of this bad boy sauce. Absolutely adore it. It will be up to 70 degrees today so I need to find myself some spare ribs quickly. I just don't know what English mustard is. Is it similar to Dijon? Thank you for sharing this. I need to go wipe off my keyboard now. Wow, I'm ready to eat.